Attenborough's Muddled Thinking Can't Stop Human Evolution : 13.7: Cosmos And Culture Revered naturalist and filmmaker Sir David Attenborough recently startled scientists by declaring that humans are no longer evolving. Commentator and anthropologist Barbara J. King offers a clear response: Attenborough is wrong. Human evolution is an unfolding process with chapters yet to be written; no one really knows where we're going. 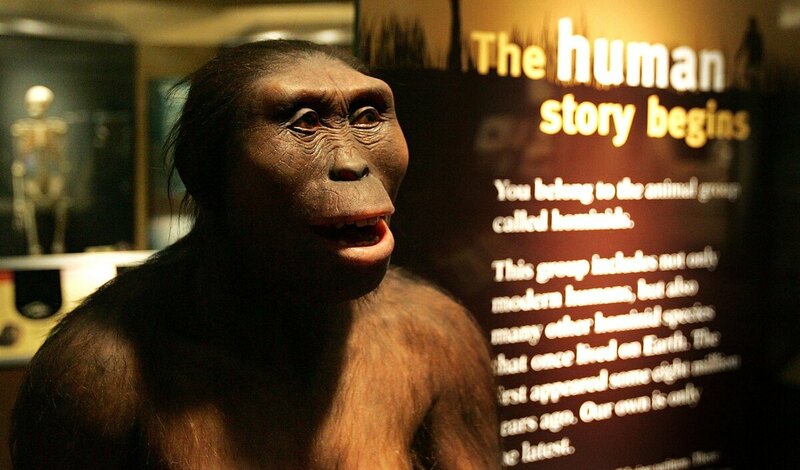 But we can look back to earlier chapters, with ancestors like Australpithecus afarensis, including the individual we call "Lucy" (seen above), for an understanding of how evolution works and what has happened to us over time. With stunning imagery and cogent commentary, British naturalist and filmmaker Sir David Attenborough has brought science into millions of homes, including mine. I think that we've stopped evolving. Because if natural selection, as proposed by Darwin, is the main mechanism of evolution — there may be other things, but it does look as though that's the case — then we've stopped natural selection. We stopped natural selection as soon as we started being able to rear 95–99 percent of our babies that are born. We are the only species to have put a halt to natural selection, of its own free will, as it were. Stopping natural selection is not as important, or as depressing, as it might sound — because our evolutionary process is now cultural. Isn't it just a bit soon to be including the entire human species in such a privileged, healthy, well-nourished, low-mortality, high-life-expectancy state of nature that has "stopped natural selection" on ourselves? I think we have a long way to go before this definition of humanity is afforded to all humanity. But even more fundamental problems plague Attenborough's perspective. Climate, weather, geological processes, disasters, infectious diseases, parasites ... these are just some of the things that affect our evolution through natural selection, as well as all the species we depend on for food. Evolution occurring just as constantly in everything around us as it is in us will directly and indirectly affect our future evolution. Any genetic-based infertility, condition that directly or indirectly inhibits procreation, or disorder or disease that ends a person's life before they pass it on will disappear due to natural selection. So regardless of medicine and birth control, there will always be lineages that are more prolific than others (i.e. differential reproductive success) and there will always be lineages that disappear — both due to constant natural selection. The same is true about differential reproduction due to constant genetic drift — that is, chance change in a gene or trait's frequency over time or differences in a gene or trait's frequency between populations due to chance differential reproduction (and other evolutionary processes occurring differently in those populations). Like selection, drift is always occurring, but it can escalate in intensity, for example, after a tsunami [when segments of a population may, sadly, die, by chance circumstances, and thus shift the make-up of the gene pool]. There's no question that human populations are still changing, even in our modern environments, because long-term studies have tracked how many kids people have in association with lots of biological traits. What Dunsworth (who also blogs on science) and Hawks (another academic with a penchant for blogging) say fits beautifully with what I teach my students at William and Mary — an unsurprising convergence, since it's based on material fundamental to evolutionary science. Examples useful for talking to students about our continuing evolution range from milk-drinking by (some) human adults to the relatively recent emergence of blue eyes. Now, admittedly, even before this week, Attenborough has not always aligned himself with credible science. When he came out in favor of the aquatic ape hypothesis — the discredited idea that human characteristics emerged because we evolved partly in water — scientists were quick to explain his mistake. Attenborough's newest statements on modern humans' supposed taming of natural selection, and the end of human evolution, are tied to a narrow view of humans' lives around the world and to a misreading of evolutionary science. In short, Attenborough is wrong. Biological and cultural creatures that we are, we modern humans are part of a dynamic web of life. Like other species around us, we're evolving physically (as well as culturally) all the time.